"Buchanan's popular illustrated guide to Strathendrick, Aberfoyle and district"
Leaving the village by Dunmore Street, so named after the founder of the village, a few hundred yards along on the left is the United Free Church Manse, built to designs furnished by Alexander Thomson, the famous architect. " Greek Thomson, M as he was known in his profession, on account of his preference for the Grecian style of architecture, was a native of Balfron, being born in Printers' Row, in the low situated house opposite Neilson Terrace, at the lower extremity of the village. Fine specimens of his genius may be seen in some of the public buildings in Glasgow. Elcho House is situated of Printers' Row. It was the home of the Richard Barnwell and his family. Legend has it that Harold and Frank flew their first gliders from the grounds. Further information on the house would be welcome. Also known as Orchardlands, it is an intact house dating from the later Georgian period. According to Thomson it was formerly used as a schoolhouse. In 1832 it was inhabited by William Jaffray (he laid the foundation stone of the adjacent church in that year). Late 18th century with later addition. 2-storey; 3-bay; symmetrical; rectangular-plan; detached house with short single storey service wing (probably slightly later) to W. Harled with painted ashlar dressings. Eaves cornice. Architraved openings. GATEPIERS AND BOUNDARY WALL: pair of square-plan sandstone ashlar gatepiers adjoining small section of wall to W of house; chamfered at arrises with base course, frieze, cornice and rounded coping; identical pier to pedestrian entrance immediately to W. Coursed rubble boundary wall adjoins to W and to E of house and continues to W at right angles to S; partially with rounded coping. 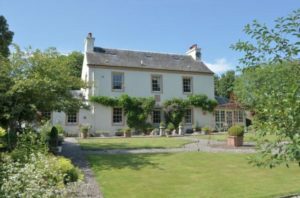 Ballindalloch was placed on the market in May 1973 at a price of offers over £45,000. It was advertised as having 9 bedrooms, 2 reception rooms, a billiard room and a gun room. There was also a 'Luxury flat with roof garden'. Sandy and Sue Stephen bought Ballindalloch in 1976 from John Glen. The Victorian mansion was unsuited to modern living and they embarked on a modernisation programme that involved demolishing 25 rooms. A finely detailed earlier-mid 19th century stable complex built for Ballindalloch House. The original Ballindalloch House, which appears on William Edgar's survey of 1745, was demolished in 1868 and replaced by a new building of the same name. Some of this later structure remains as the present Ballindalloch (although large parts of it were demolished in 1967-69). At the time of the contruction of the stable complex, it would appear that the house and estate belonged to Mr Samuel Cooper. B-Group with Sundial, Walled Garden and N and S Lodges, Ballindalloch (see separate list descriptions). A finely detailed earlier-mid 19th century stable complex built for Ballindalloch House. 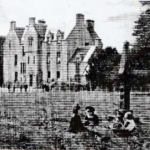 The original Ballindalloch House, which appears on William Edgar's survey of 1745, was demolished in 1868 and replaced by a new building of the same name. Some of this later structure remains as the present Ballindalloch (although large parts of it were demolished in 1967-69). At the time of the contruction of the stable complex, it would appear that the house and estate belonged to Mr Samuel Cooper. Earlier-mid 19th century with later alterations. Single storey and single storey and attic complex comprising U-plan stable block and formerly detached cottage (said to have been byre originally) to N; stable block extended on W side to adjoin cottage and converted to pair of cottages 20th century. Symmetrical principal (S) elevation to stable block with large central round-arched passageway through to stable yard; crowstepped gables with moulded skewputts throughout. Harled with droved sandstone dressings. Base course to principal elevation of stable block; eaves course throughout. Vertical margins at arrises of stable block. Openings mainly architraved (apart from those to ground floor of W elevation of stable block, later extension on this side and inserted dormers; those to cottage painted). Sundial: B-Group with the Old Stables, Walled Garden and N and S Lodges (see separate list descriptions). A fine example of a 17th sundial type. According to Stevenson it was innovative in introducing new designs for shaft motifs which later became widespread. The incised motifs partly worked as dials in their own right. Additionally there would have been a number of gnomons on the various sides of the polyhedron head and obelisk finial. The original Ballindalloch House, which appears on William Edgar's survey of 1745, was demolished in 1868 and replaced by a new building of the same name. Some of this later structure remains as the present Ballindalloch (although large parts of it were demolished in 1967-69). According to Stevenson the property was acquired by John Cunningham in around 1678 and the sundial might date from this time (erected to commemorate the event). It was previously situated slightly further to the N.
Probably later 17th century. Obelisk sundial. Sandstone ashlar. Square-plan shaft surmounted by polyhedron head with tall obelisk finial (approximately 2.5 metres tall in total). Base comprising 2 square-plan steps surmounted by one circular-plan step. Shaft carved into 4 false courses; variously shaped incised motifs carved one to each side of each 'course' except for N side, which has only one motif (to 3rd 'course); motifs include circles, hearts and diagonal lines (either separately or combined). 8-sided polyhedron recessed at arrises with horizontal band (incised to outer planes, projecting at recesses) to centre. Obelisk finial carved into 7 false courses (top one damaged). Gnomons to polyhedron and obelisk finial missing. Walled garden: Probably early 19th century. Rectangular-plan walled garden. Sandstone rubble with squared sandstone coping. Entrances to N and S and (enlarged) to W.
B-Group with the Sundial, Old Stables and N and S Lodges (see separate list descriptions). A substantial intact walled garden, probably of early 19th century date. 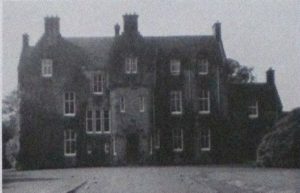 The original Ballindalloch House, which appears on William Edgar's survey of 1745, was demolished in 1868 and replaced by a new building of the same name. Some of this later structure remains as the present Ballindalloch (although large parts of it were demolished in 1967-69). In the late 18th century the house belonged to Robert Dunmore, who erected a cotton mill in Balfron in 1789. By the early 1840's the house had passed into the ownership of Samuel Cooper. A well detailed earlier 20th century lodge. A smaller previous lodge (of which this could be a substantial remodelling) appears on the 1861 OS map. South Gate, pillars and boundary wall: earlier 20th century entrance gateway to Ballindalloch estate to W of lodge; comprising 3 square-plan concrete gatepiers (that to E for pedestrian entrance); all panelled and corniced with stepped coping; gatepiers of identical design (probably earlier 19th century) to E (pedestrian gateway) and SW (carriage/cart entrance). Coursed sandstone rubble boundary wall along roadside in between; mainly with droved rounded coping. 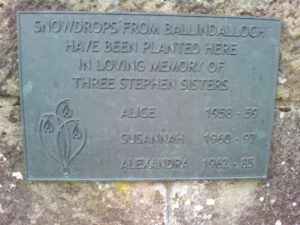 A plaque on the boundary wall commemorates three daughters of Sue and Sandy Stephen. 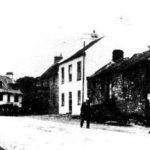 The Tontine Hotel is the dark building beyond the white house, Rockbrae, home of Mrs Veneables, who managed the shirt factory. 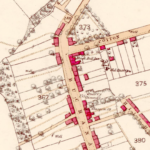 The 1865 map shows the Black Bull Hotel on this site. The Tontine Hotel, which stood at the corner of Buchanan Street and Cotton Street, was on the site of the Black Bull Hotel. The 1865 map shows the Black Bull Hotel on this site. 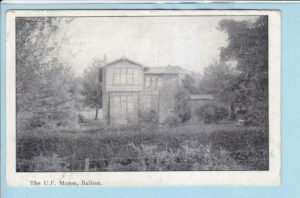 David Hunter (a coal miner) and his wife Agnes, nee Paterson, ran the "TONTEEN HOTEL" in "BELFRON". They appear on the 1915 valuation roll. 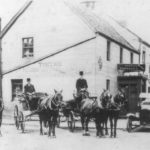 They also operated a grocery store in Baker Street, Stirling. David and Agnes had 2 sons: John and Jim, and a daughter, Mary. A tontine was a type of lottery in which the longest-lived participant won the big prize. In this case, he possibly bought the pub with it, but it could be it was held as a 'tontine'. An early dissenting church, now (1999) in poor condition as a barn. It would appear to be that referred to in the 'Statistical Account' (1796) as that belonging to '459 Antiburgher Seceders, who have had a place of worship in the parish about 60 years'. One of the earliest dissenting churches in Scotland. It was built following the establishment of a Secession Movement (from the Church of Scotland) in 1733. 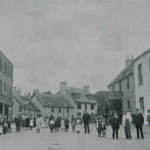 Balfron appears to have sustained one of the earliest Secession congregations, which met in the 1730's on the banks of the Endrick Water at nearby Honey Holm. Sometimes the Revs. Ebenezer Erskine and Ralph Erskine, two of the founders of the Secession Movement travelled to preach here. In 1742 the congregation got its first permanent minister, the Rev. John Cleland. The church's Session Book details procedings at the 'meeting house of Balfron' from 1742 onwards (the church must have been built at or shortly before this date). By the 1860's it had become the United Presbyterian Church of Balfron. It was replaced by a new United Presbyterian church at Honey Holm in 1865 and descended into use as a farm building. Earlier 18th century. Rectangular-plan (formerly T-plan incorporating aisle to N); former United Presbyterian church (now barn). Symmetrical design with flat-arched openings with splayed voussoirs (except to N elevation); keystones to those to former principal (S) elevation. Coursed sandstone rubble with ashlar dressings. Eaves cornice. Flush surrounds to openings (except to N elevation). INTERIOR: practically no evidence of former use remaining. Roof trusses replaced (corbels formerly supporting gallery partly intact). • in 1862 Sir Archibald Orr Ewing commissioned the building of a grand Scottish baronial pile at the estate of Ballikinrain, which he had just bought (originally styled as being “near Killearn” but now its postal address is Balfron), in Stirlingshire. 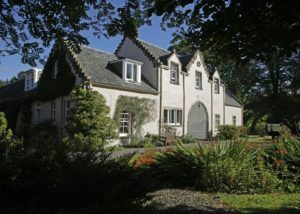 He left Lennoxbank House on Ballikinrain’s completion in 1862 and lived there for the rest of his life. At about the same time he bought the estate of Edenbellie which was close to Ballikinrain, and also the estate of Gollanfield between Inverness and Nairn. Ballikinrain Castle is a fine example of baronial architecture incorporating many traditional features into the impressive elevations.Sandstone walls, pitched and slated roofs and ample windows create a majestic main building with an associated stable block. In addition, there is a modular building housing classrooms and sports hall building and 2 timber chalets are constructed on site.The main building and former stable block have been the subject of considerable capital expenditure and the buildings and grounds have been well maintained. The buildings are situated within a large, mature country estate setting, with substantial woodland areas, burns and waterfalls. 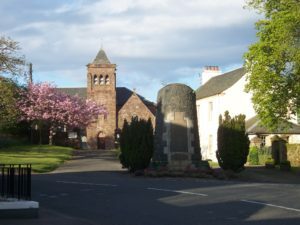 The Balfron War memorial is located in The Clachan, at the entrance to the church. A Service is held at the memorial on Armistice Sunday, immediately following the church service. 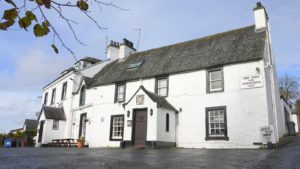 The Pirn Inn is a village public house currently trading on wet sales alone. A Chinese takeaway service operate from withing the building. The property is a former hotel with letting rooms, and before that, a bank. Possibly, originally, it was a residence. The main part of the building is largely intact from the time of its conversion to/extension as a bank in the earlier-mid 19th century. This would appear have to have happened fairly recently prior to 1841, when the Rev. Alexander Niven stated in 'The New Statistical Account' that "and now, too, for the accommodation of all, there is a branch of the British Linen Company's Bank amongst us". Valuation rolls appear to show that the British Linen Bank took over the building on the site of the current Bank of Scotland on the corner of Buchanan Street and Cotton Street in 1889. The building was replaced in 1923 by the current property. Late 18th/early 19th century; extended to W earlier-mid 19th century; with alterations and additions. 2-storey and attic; 3-bay; rectangular-plan original block; extended to W to adjoin later; slightly taller; 2-storey and attic; 3-bay; rectangular-plan block via linking bay; single storey additions to N. Both main blocks regularly fenestrated to principal (S) elevation and with later gabled porches. Original block probably formerly house; extended earlier-mid 19th century as bank (probably when W block added); now public house. Roughly coursed stone (apart from to principal elevation of W block, which is rendered and lined as ashlar) painted white; ashlar dressings painted black. Base course to both main blocks; eaves band to earlier one (and to N side of W block); frieze and eaves cornice to principal elevation of W block; vertical margins at arrises of W block. Moulded architraves to openings to principal elevation of W block and linking bay (those to ground floor continued down to base course forming aprons); architraved windows (slightly enlarged) to ground floor of principal elevation of original block. Details to come - you can help!